How often do you ride in another part of the country? There are an estimated 6000 miles of Green Roads in England and Wales and chances are most of the time people ride what they know. 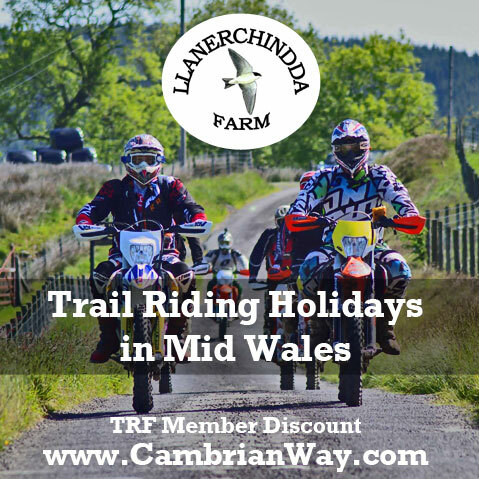 The TRF is a great way to explore further afield with regional groups who put on events that make it easy to get out onto new trails. 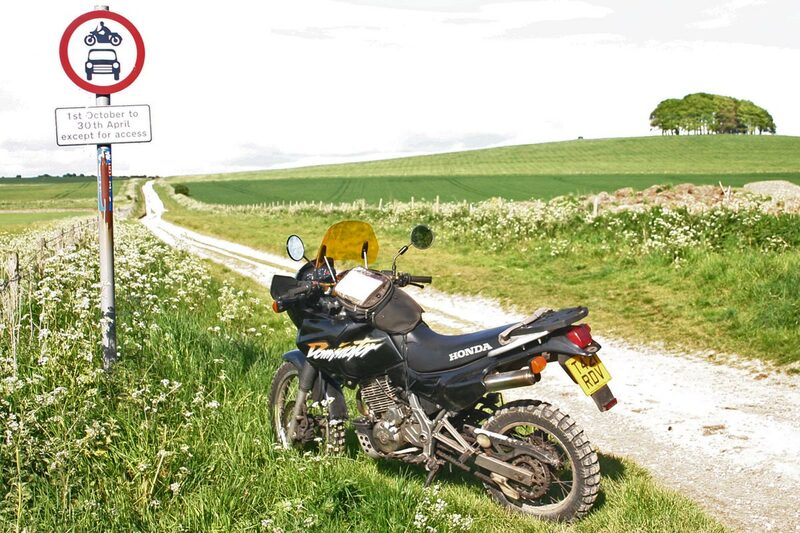 Wiltshire is blessed with some of the best byways in the country, and there are hundreds of miles of them, from the ancient Roman Road of the Fosse Way running down from the Cotswolds to the West of the County to the Great Ridgeway in the East. There are trails right across Salisbury Plain to the south and all points in between, including several near Stonehenge. 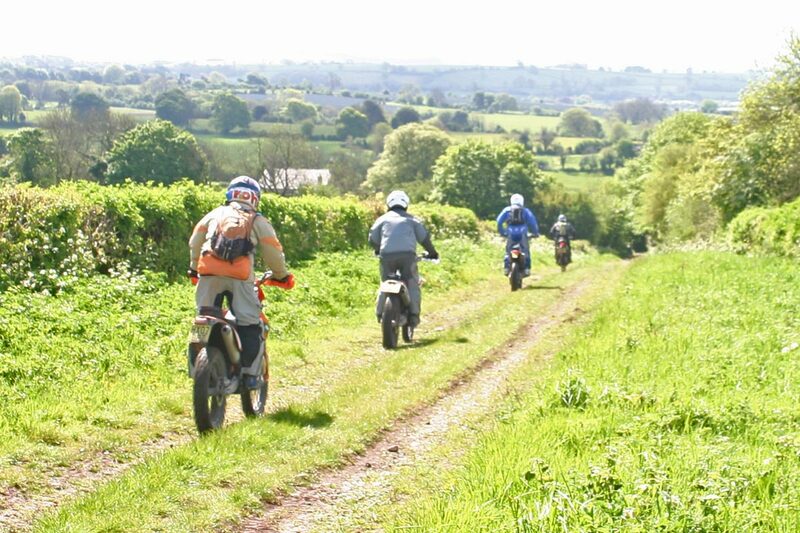 Organised by the Wiltshire TRF, the Wessex Wanderer is a well-organised weekend of volunteer-led trail rides across Wiltshire and its neighbouring counties. 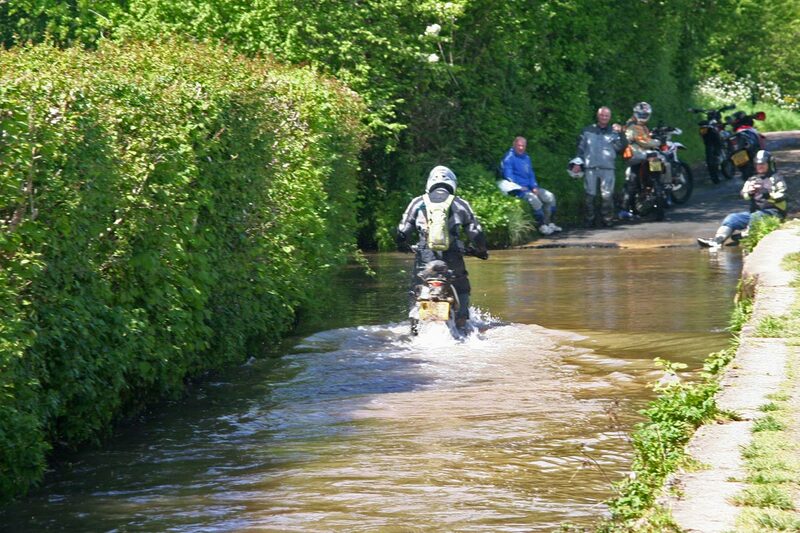 Its origins go back to 2006 when a one-day navigational event was run, modelled on the Welsh National [Road] Rally and called 'The Tour de Wessex'. There are lots of these in Wiltshire! The Wessex Wanderer itself goes back to 2011 and this year chief organiser Keith Johnston had 80 participants to contend with, from as far afield as Norfolk, Yorkshire, Manchester and the North East although, as you would expect, most were from south of Watford Gap. 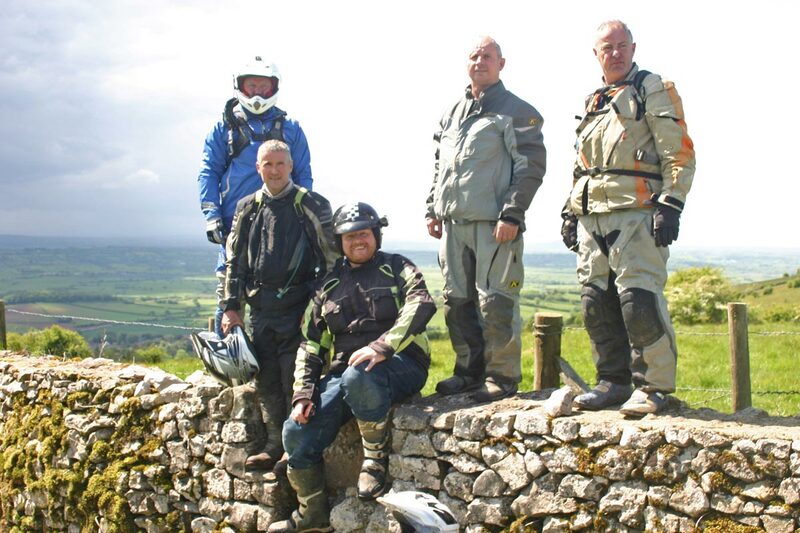 They were divided into 16 groups of riders (five plus a run leader), with five groups doing ‘gentle and scenic’ routes and the other eleven doing ‘intermediate’ ones, each day. Not all the run leaders came from Wiltshire either; there was one each from Devon, Central Bristol and Hertfordshire. 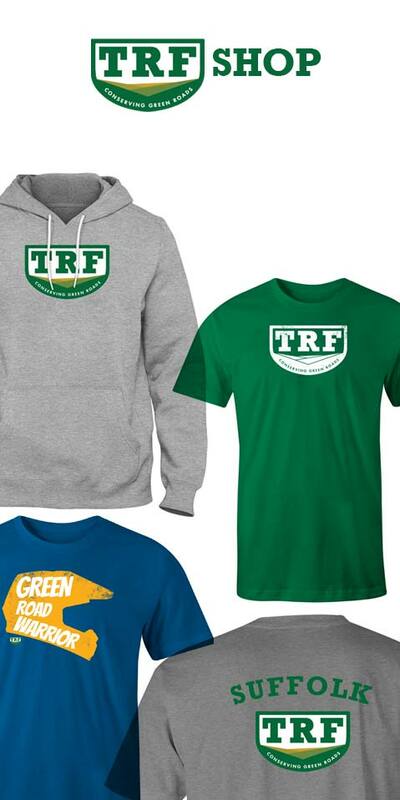 A reminder of the TRF Code of Conduct was sent out with the final instructions and naturally followed by all the run leaders. 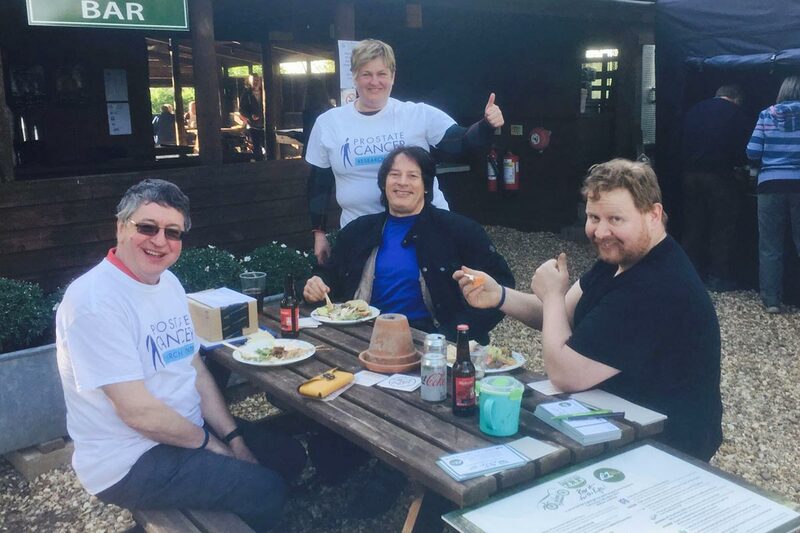 Apart from the inherent attractions of the event, for me, it was also a chance to reunite with all three of my fellow-riders on the 2015 JOGLE (John O'Groat's to Land's End) trail ride: Carla McKenzie, James Higgs and Andrew Byatt (all Wilts TRF members). 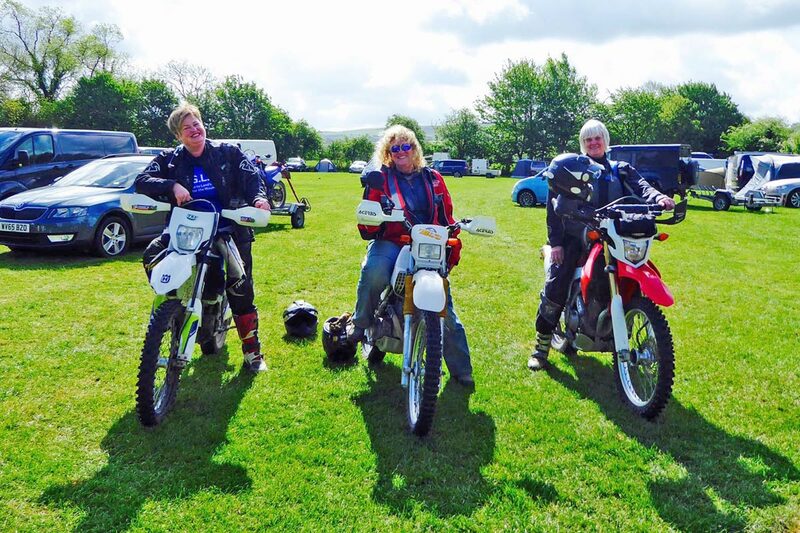 I rode my freshly re-shod Honda Dominator 650 down from London to the Calne campsite where the event was based on the Saturday morning. Typically, I arrived too late to join one of the organised runs but I’ve been trail riding in Wiltshire for over thirty years so I was happy to do some of the local lanes on my own and in fact re-traced much of a route which I did with Carla McKenzie as part of her preparation for the JOGLE, but in the opposite direction, with some deviations to take in some trails I hadn't done before. 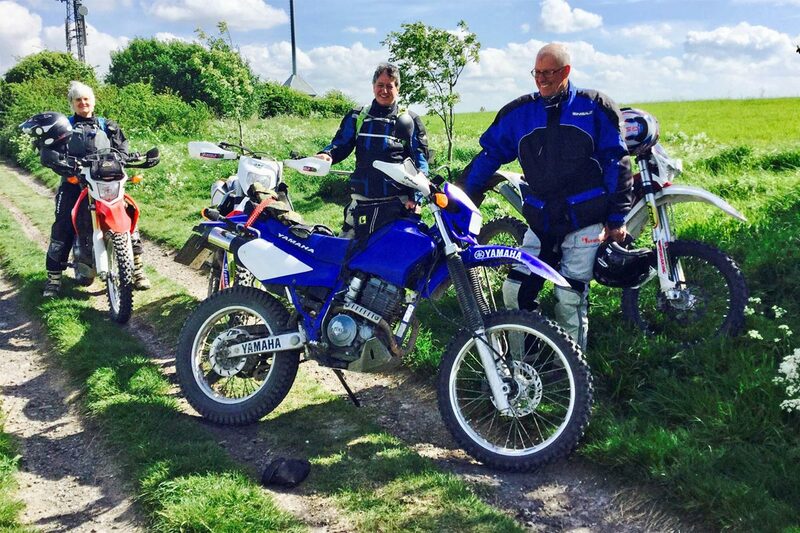 I started near near the Civil War battle site of Roundway Down and ended up at a pub opposite the famous standing stones at Avebury discussing the merits of big KTMs versus the new Africa Twin 1000, with a couple of new owners. A group of Wessex Wanderers rode past coming from the Ridgeway as we were talking and I rode a few miles of the famous route myself before taking in another new-to-me trail south of the A4 before returning to base. When I got back to the Blackland Lakes campsite there were big smiles on the faces of all the riders as the various groups returned. The last group to arrive had covered over 170 miles! After an excellent barbecue and a few sherbets the highlight of the evening was the draw of the raffle organised by Carla McKenzie and Andrew Byatt which, thanks to some great prizes and some very professional marketing, had raised £2,000. 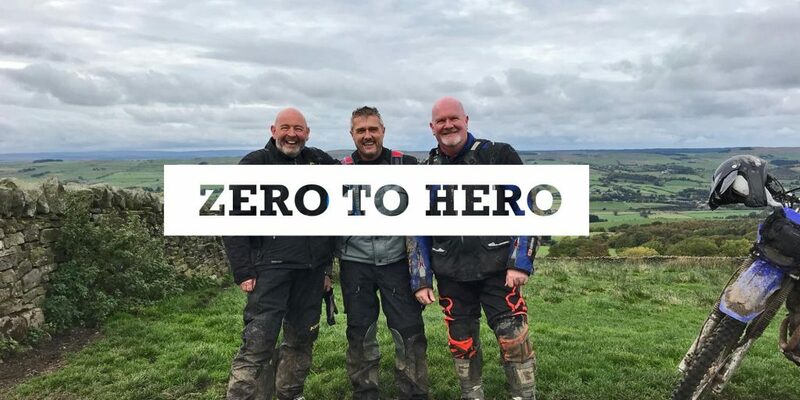 Combined with the entry fee of £100 the whole Wessex Wanderer event raised £4,000 which will be split equally between the TRF Fighting Fund and Prostate Cancer Research. Young James Higgs had led a group almost to Cheltenham on Saturday but on the Sunday I was happy to join him on a run that took us South West into Somerset. 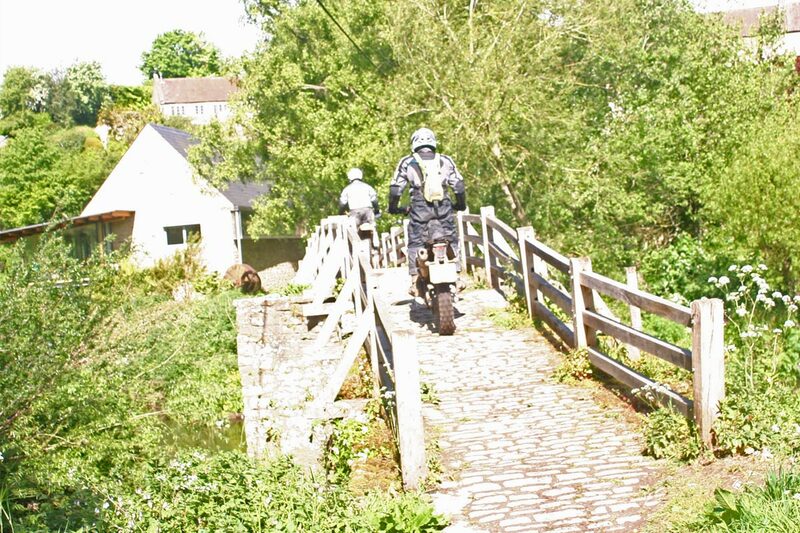 After riding a few lanes near Keevil airfield and Trowbridge we crossed the county boundary and the river Frome via an ancient and beautiful but very narrow stone packhorse bridge at Tellisford. 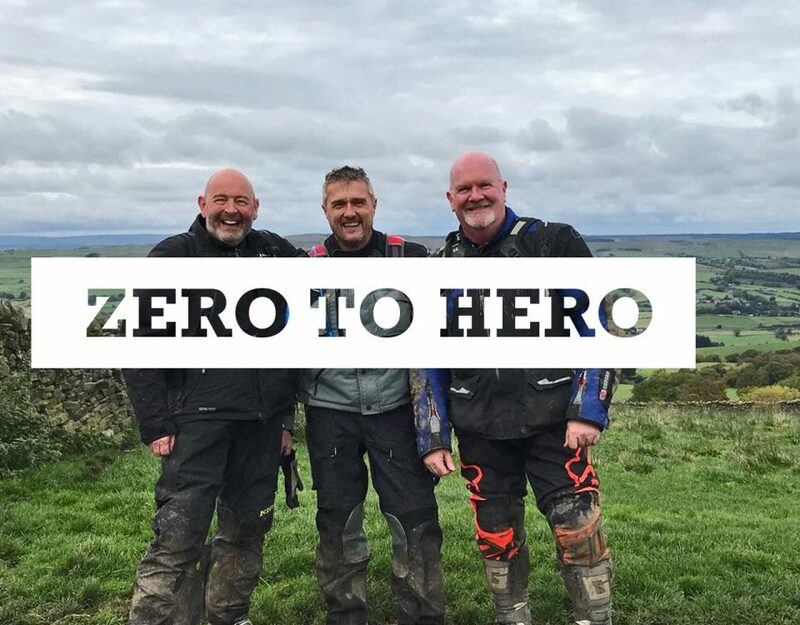 There were quite a few road miles between the byways but it was worth it to do some interesting and memorable lanes, including one steep and overgrown climb which caught me out and had me pleased to have some lifting assistance from my fellow riders! Jimmy’s route took us to Wooky and Wells, within sight of the striking Glastonbury Tor several times and past the gates of Worthy Farm, at Pilton, home of the Glastonbury Festival. One trail near Wookey Hole coincided with about 200 metres of stream, some of which was pretty deep, but thankfully no-one came to grief. 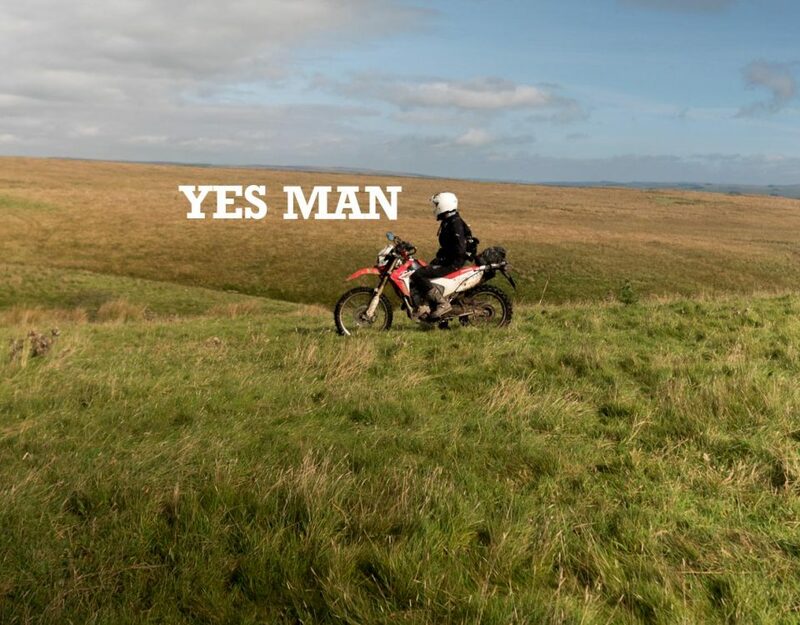 James is a skilful rider who likes to get a move on, but he’s a big lad who doesn't believe in rising out of the saddle to let his legs soak up some of the shocks, so I wasn’t entirely surprised when his trusty KLR 650 copped a compression front puncture near Chew Valley Lake. Fortunately we were able to combine fitting a new tube with a tea break at a nearby farm café, which, even more fortuitously, coincided with a brief but torrential downpour. So we stayed dry! Three of the guys in our group were from the Isle of Wight and sharing a van which was packed up and loaded to the gunwales in record time as they dashed off to catch a ferry from Portsmouth. Turned out that in addition to their modern enduro bikes they all also had XT500s which they'd all bought specifically to do Austin Vince’s twin shock challenge in the Pyrenees. Amazingly, they actually rode all three bikes right across France to get to the event, and then proceeded to win it outright before riding home. Impressive! Meanwhile Carla McKenzie had survived her first ever attempt at run-leading, with an all-girl group which included Becky Burbidge who organises the Wilts TRF’s support of local horse trials and is the wife of Steve ‘Bakerman’ Burbidge, who is a bit of a local legend for all the fund-raising for charity he does in all sorts of ways. 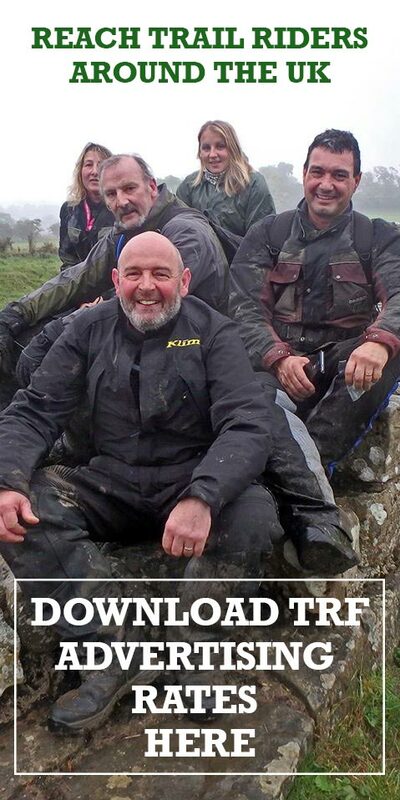 Steve runs the 'Great Escape' trail riding event just after Christmas every year and was boldly run-leading on his BMW R1200GS, and had another 1200 in his group too. In contrast the smallest bike I saw was a Yamaha 125 and there was every type of trail bike in between, from Huskies to XT600s but you won’t be surprised to hear that a lot of them were orange! My own trail drama came at the end of the day, after the Wessex Wanderer was officially over. I was riding an easy trail route from Cherhill to Wootton Basset, which I’d done several times before, but only in the opposite direction. 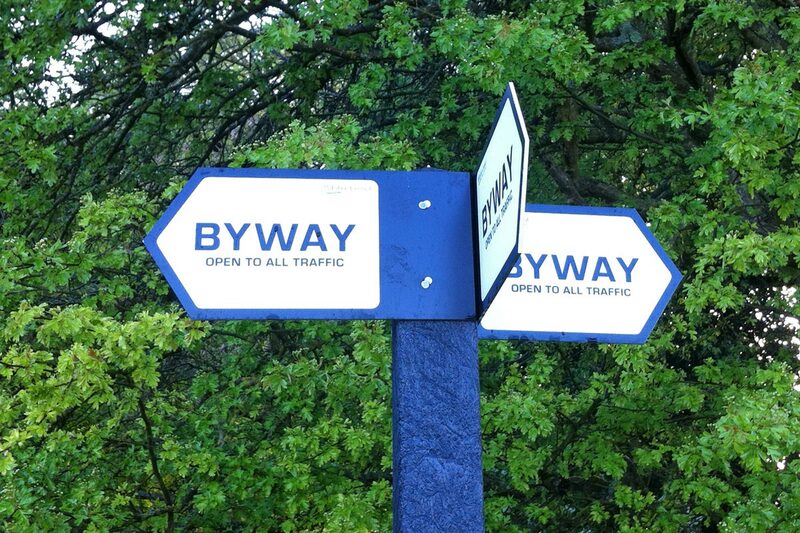 I missed a turn and found myself on a previously unridden byway. Rather than turn around, I worked out a new route to get back on track but unbeknownst to me, the new route took me on a byway that turned into some of the stickiest clay-based gloop I have ever encountered. I actually dropped the bike as the glue-like clay jammed between the tyre and the low front mudguard and locked my front wheel solid. After several futile attempts to unblock the mudguard I realised that there was nothing for it but to unbolt it completely, along with fork brace beneath. I’ve only once had to do that before, when I foolishly rode a BMW Funduro F650 in the Wyegate Long Distance Trial about 20 years ago. I finished the trail with the mudguard strapped on the back and a face full of mud! 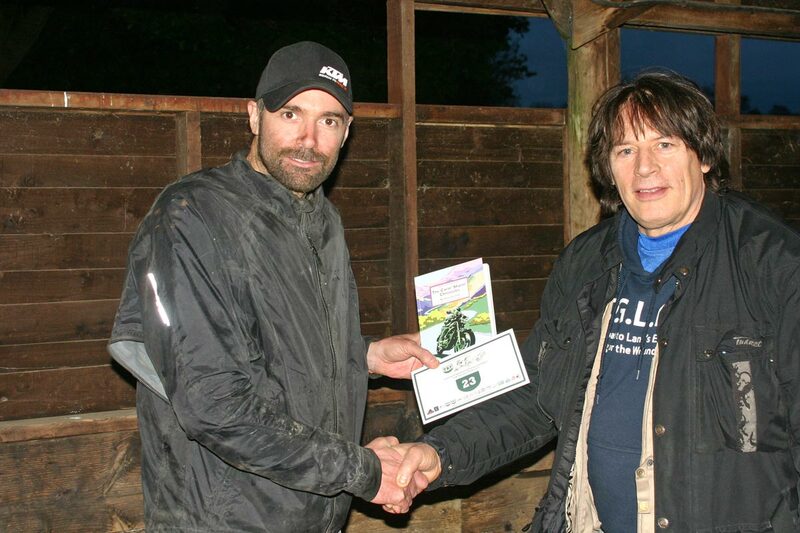 Many thanks to the Wiltshire TRF for putting on such a great event especially chief organiser Keith Johnston, but also all 28 of the volunteers who helped over the weekend by leading runs, selling raffle tickets and doing all the admin. By common consent it was the biggest and best Wessex Wanderer yet. Next year’s event is scheduled for May 12th and 13th 2018. See you there? 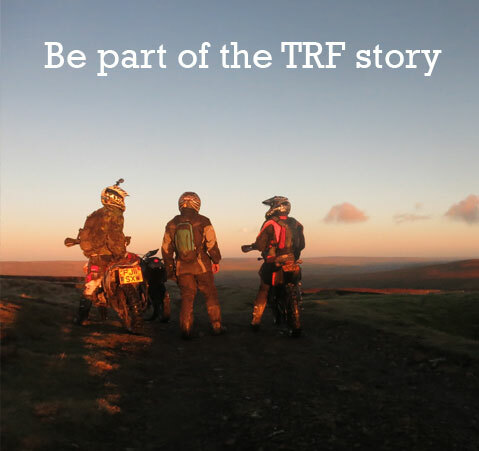 The TRF Facebook Page is a great way to find out about events like the Wessex Wanderer all over the country throughout the year.